Blueprint for Success in College and Career is a student’s guide for classroom and career success. Curated, co-authored, and edited by Dave Dillon, this set of OER is helpful for students embarking on their college journey. Take a look at the book online, download it in multiple formats, or keep reading to learn more! Rebus Community is very pleased to announce that the Blueprint for Success series is now available for adoption and use in classrooms! The series comprises three books for the College Success and FYE (First-Year Experience) genre. 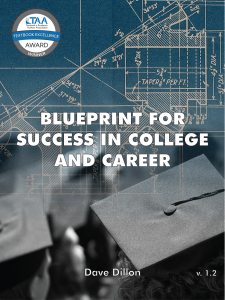 The central text, Blueprint for Success in College and Career, is designed to show how to be successful in college and in career preparation, and focuses on study skills, time management, career exploration, health, and financial literacy. In addition, targeted sections on Study Skills and Time Management, and Career and Decision Making are available separately as Blueprint for Success in College: Indispensable Study Skills and Time Management Strategies, and Blueprint for Success in Career Decision Making. Each book has been carefully curated, co-authored, and edited by Dave Dillon and peer-reviewed by subject experts at institutions across North America. The books are available in multiple formats including web, PDF, EPUB, MOBI, and editable formats such as XHTML, WXR, XML, and ODT. The series contains adapted sections from Foundations of Academic Success, A Different Road to College: A Guide for Transitioning Non-traditional Students, How to Learn Like a Pro!, and College Success, and covers a range of topics including college level critical thinking and reading, test taking strategies, health, finances and resources, social interaction and diversity, and more. If you’re interested in adopting the series, or books in the series, please let us know on the project homepage! Dave began working on this book as early as 2009, as his work as a counsellor and instructor showed a clear need for a comprehensive set of resources to help students in their college journey. He explains, “Many students do not learn how to study effectively and efficiently or how to manage their time. Others aren’t certain what to choose for their major or their career. And some are lost trying to navigate through the maze and culture of college, often balancing their school workload while working and taking care of family responsibilities. Students are sometimes unsuccessful when they begin college—not for lack of motivation or hard work, but because they did not acquire the skills or information necessary to allow them to succeed.” With this series, Dave hopes that students will be able to obtain the information and skills they need to confidently maneuver through classes and college. He hopes that the tone of the book will resonate with students, as sought to create a College Success textbook that genuinely read as people having a conversation together — as though it was talking with students rather than at students. The Rebus Community worked with Dave throughout the writing process, advising on formatting, licensing, images, and other questions that arose. We also recruited reviewers and coordinated the peer review process for the book, and were fortunate to find a wonderful group of reviewers who generously shared their expertise. Rebus also helped recruit volunteers to prepare a glossary of terms for the book, and assisted Dave in formatting, running accessibility checks, and other final stages of publishing. We are very excited to be celebrating the release of this series! Dave has worked tirelessly to ensure that the series is a comprehensive and valuable resource for students, and we couldn’t be prouder of both him and the books. If you’re interested in adopting any of the Blueprint for Success in College texts, please let us know in Rebus Projects. 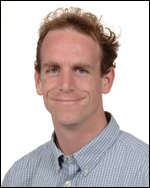 Dave and other faculty at Grossmont College are working to develop openly licensed ancillary materials to accompany the books. These include multiple choice quiz questions, developed by Dave, and powerpoint slides, created by Rocio Terry. Janice Johnson has implemented content from the Study Skills and Time Management book into Canvas, which is a great way for like-minded instructors to adopt the text. We’ll share these ancillaries as they are completed, so stay tuned! We would also love to hear from anyone interested in collaborating on ancillary development or who might be adapting this resource to better fit their needs. You can always reach us via the project homepage or email us at contact@rebus.community.